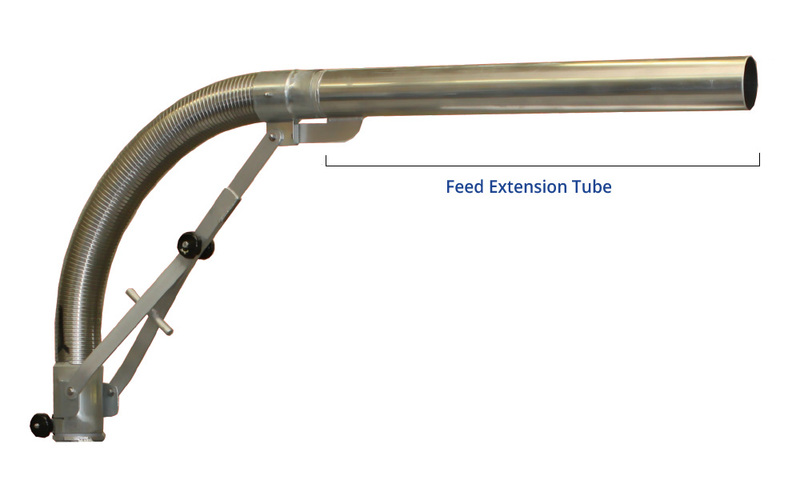 A lightweight aluminum tube assembly designed to offer additional feed broadcast distance for those using our optional Periscope Feed Head™. This Feed Extension Tube is offered in both 4-inch (10.2 cm) and 5-inch (12.7 cm) sizes with a range of lengths up to 6 ft (2 m). All Feed Extension Tubes are designed to bolt to the Periscope Feed Head’s outlet collar and are specifically used to concentrate airflow and impart the maximum amount of air blower energy into the feed pellets for maximum feed broadcast distance. Feed exiting the hopper for mixing in the blower airflow tends to tumble and bounce along the feed broadcast hose assembly resulting in lost transport energy. The addition of a straight section of rigid tube before feed exits the broadcast hose allows the feed pellets to settle down in the airflow and ensures all available air blower energy is imparted to the pellets to accelerate them before the feed exits out over the pond, pen, or raceway. Complimentary feeder options are the Feed Extension Boom and Gullwing Deflector. Concentrates air flow energy and allows feed pellets to settle down in the airflow for maximum energy transfer and maximum feed broadcast distance. Light weight assembly slides over feed broadcast assembly outlet and is quickly secured using a single mount bracket and bolt hardware provided.